Autumn is underway and there are many wonderful jobs to do in the garden! On any glossy brochure promoting our native flora and wildflower tours you will see images of brightly coloured Everlastings as far as the eye can see. In the wild these fast growing annuals perform brilliantly under extreme conditions. They germinate with the first rains in winter and by late August are in full flower, adding bright colour to the otherwise harsh landscape of outback Australia. These plants are so easy to grow in your own garden and really don’t need much care at all. The Pink and White Everlasting (Rhodanthe chlorocephala subsp rosea) puts on a spectacular show and is perfect for any sunny position. 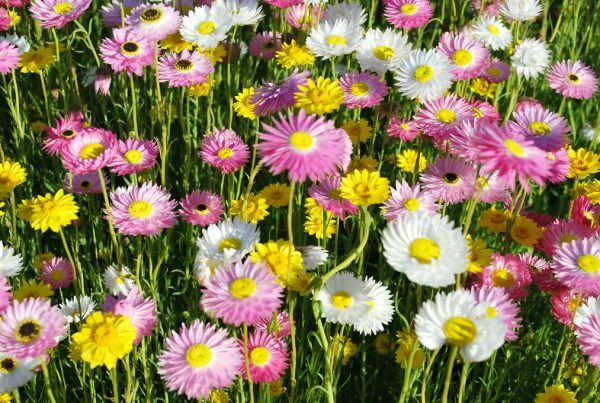 The easiest way to establish Everlastings is growing by seed, sowing in autumn before the soil temperature cools down. 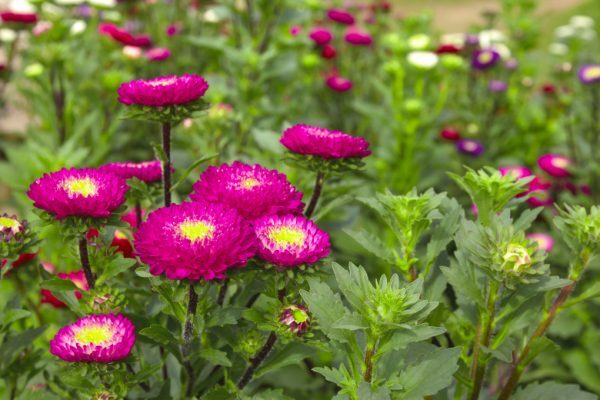 Remove any weeds from the area, as Everlastings don’t compete very well with vigorous weeds. Rake the soil over to loosen the top layer and add a quality soil improver (about 1 ice-cream container per square metre) with 1 handful of Pure Blood and Bone and rake smoothly. The extra nutrients from the soil improver will help nourish the small seedlings as they germinate. Take the seed and put in a bucket with Organic soil improver and mix thoroughly. This acts as a spreader and will ensure even coverage of the seed. Pure Everlasting seed will pack together and trying to spread without this step results in a patchy verge. Spread the seed/soil improver mix and rake lightly. Water in well or wait until the first rains. They will germinate very quickly and will respond to an application of PowerFeed Controlled Release Plant Food Flowers, Fruit & Citrus when they are about 10-15cm tall. PowerFeed Controlled Release Plant Food Flowers, Fruit & Citrus will release nutrients slowly and result in strong stems and spectacular flowers. When plants reach approx 5cm nip growth tip out to encourage multiple stems, which results in many flowers. Apply Seasol (30mL concentrate per 9 litres of water) every 2 to 4 weeks to promote strong root development and healthy growth. To extend the flowering season, apply PowerFeed for Flowers, Fruit and Citrus (liquid) every 2 to 4 weeks (50mL concentrate per 9 litres of water). The Aloe Vera is the perfect first aid solution in a pot. This easy to care for, hardy succulent is the medicine plant of choice for many families. For centuries this plant has been used extensively in many cultures to treat burns, healing cuts and grazes and helping with aches and pains. Luckily for us it is so easy to grow in Australian conditions. Even the smallest garden can find space for an Aloe Vera plant, all that it requires is at least 6 hours of sun per day to thrive. Small plants are readily available from your local garden centre, or if you have a friend with an advanced plant it’s easy to break a small piece off. 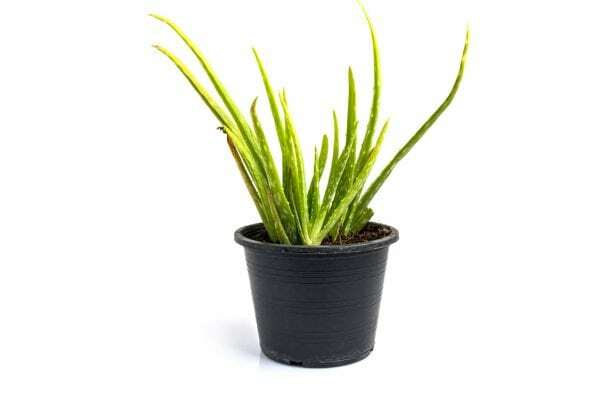 Being a succulent, Aloe Vera will rot easily if overwatered, so plant in cacti and succulent potting mix. These specialty mixes are designed to drain freely and are perfect for beginner gardeners or those who tend to kill plants with kindness. Place in a sunny position – the more sun the better at this time of the year. PowerFeed Controlled Release Plant Food All Purpose including Native Plant Food applied at the beginning of every season will ensure the plant sends out new leaves as fast as you use them. Plants can be split regularly and it’s not uncommon for one plant to turn into 10 in less than a year. The importance of improving soils with organic matter can’t be under estimated. When planting always add compost, soil improver or well-rotted manures to the existing soil. 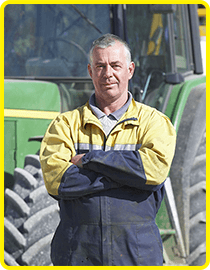 These is the magic ingredients will assist in breaking up heavy clay soils, improving fertility and available nutrients, retaining water around the roots. Improving soil is just as important if you have sandy soil or heavy clay soil. In unimproved sandy soil nutrients and water drain past the root system before the plant has a chance to take it up. In clay soils, water can’t drain away very quickly and many Australian plants that love sandy soil can become waterlogged. Soil improving is crucial to ensuring plants thrive and establish themselves easily. 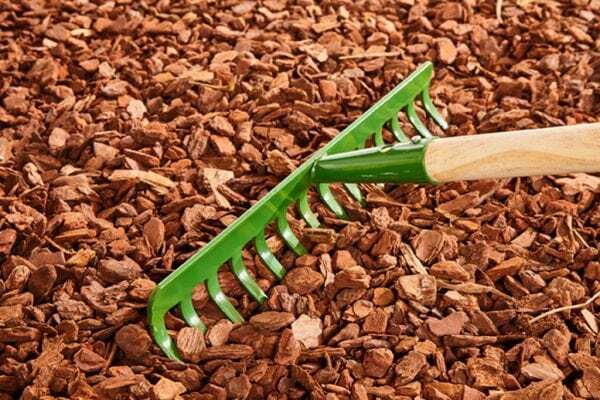 Mulching is also enormously beneficial for all plants and will assist in helping break up the heavy clay soils. Break down over time and feed the plants. Improve the soil organic matter content as they break down. Reduce evaporation loss from the surface and retain any moisture gained through rain in the subsoil for longer than if there was no mulch covering. Encourage earthworms and soil microbial activity. Restrict weed growth – any weeds that germinate are easy to remove. 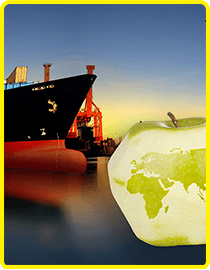 Prevent wind and water erosion. 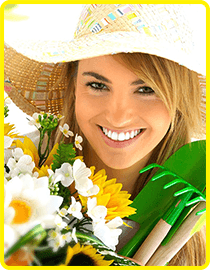 Protect the roots from daily temperature fluctuations. This includes cold temperatures in winter. Improve the appearance of the garden area. Persimmons and quinces are ripening at the moment and if you manage to beat the birds, they are two small very ornamental trees that deserve a position in any garden. Not only do they have the added bonus of the fruit, the quince tree has lovely arching branches and soft pink flowers in spring. These flowers are closely followed by gorgeous soft light green foliage and large golden apple shaped fruit. They are a hardy small tree and will thrive readily in harsh conditions. The persimmon fruits as the leaves are colouring to a bright burgundy making it a gorgeous sight with the vibrant orange fruit. The non-astringent varieties are perfect as they can be picked and eaten when crunchy. Bite into an astringent variety and your mouth will certainly know about it.